It’s that time of year again. Now is your chance to get a jump on spring gardening by starting your seeds indoors. Once you have your seeds, your soil, and your lighting squared away, you’ll need to find some containers. Frugal homesteaders repurpose just about everything, and seed starting containers should be no exception. Look for flexible containers that allow you to squeeze them when it comes time for planting. Also, you may need to poke a few holes in some containers to allow for drainage. 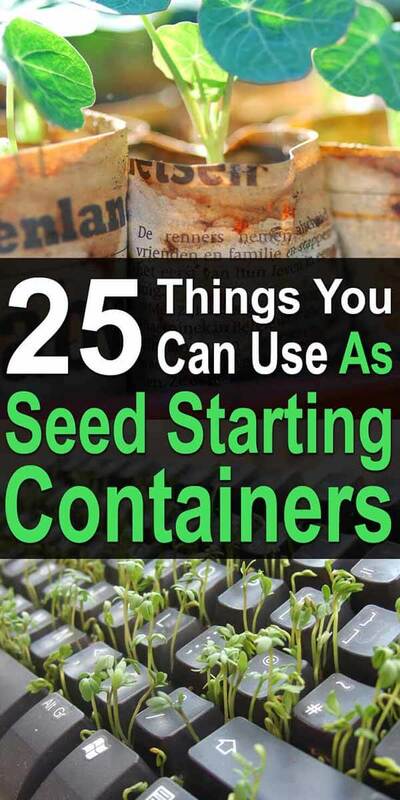 Here are 25 ideas for repurposed seed starting containers (in alphabetical order). 1. Avocado Skins and/or Citrus Peels – Hollow out your avocado, lemon, or orange peels and use them as natural seed starter containers. The skins will biodegrade, nourishing your plant as they do. 2. Baby Food Jars – These little jars are the perfect size for starting seeds. 3. Canning Jars – Have more jars than you know what to do with, or have more jars than you have lids? Use the jars as seed starting containers. 4. Cardboard Boxes — Shoeboxes, cereal boxes, gift boxes, you name it – they can hold soil and seeds. 5. Chipped or Broken Mugs or Cups – Before you toss that less-than-perfect mug, consider using it as a seed starting container. 6. Coffee Containers – Have you been wanting to repurpose those Keurig pods (K-cups)? You can use them for planting your seedlings. Just remove the used coffee grounds and the filter lining, and you’ll be ready to go. 7. Coffee Filter Cups – You can create your own jiffy-type pots with coffee filters. 8. Cut-Off Milk or Juice Containers – Either the paper carton or plastic jug varieties will work. 9. Egg Cartons – Egg carts are awesome for starting seeds. An added convenience is that you can cut each section to plant the seedlings individually. Another bonus? Most egg cartons are biodegradable and can be planted directly into the ground. 10. Egg Shells – Speaking of egg cartons, the eggs they come with are also perfect for starting seeds. When you use egg shells as planters, you not only have a convenient (and cute) little pot, but you can pop it right in the ground. Eggshells biodegrade and provide nutrients for your seedlings. 11. Foil Trays – You can reuse the small trays from frozen entrees or deli items. 12. Food and Drink Containers – Instead of tossing that trash from your take-out meal, consider re-purposing the packaging for your seeds. 13. Fruit or Veggie Boxes – Repurpose those small plastic boxes that you get with your fresh berries, cherry tomatoes or mushrooms. The attached lids offer extra warmth for your growing plants. 14. Ice Cube Trays – Handy and stackable, ice cube trays are convenient to use for starting seeds. Use ones you have stored away or find some inexpensive ones at a yard sale or thrift store. 15. Lasagna Pans – These trays frequently come with clear lids that you can use to create a greenhouse effect for your seedlings. 16. Muffin Tray – The individual cups in an old muffin tray are perfect for starting seeds. Make a four-sheet stack of newspaper and cut the stacks into thirds lengthwise. Place the can on the newspaper, leaving about an inch at the end. Roll the can along the newspaper until it is wrapped loosely all the way around. Next, fold down the edge of the newspaper over the can, working your way around the can until all the edges are folded firmly. Turn the can right side up, pressing down on the folds to crease the edges against the bottom of the can. Now, slide the can out and you have a biodegradable pot! It may seem flimsy, but it will become sturdy after you fill it with soil and moisten it. Later, you can plant your newspaper pots right into the garden, since the newspaper will decompose naturally in the soil. 18. Old Seed Starter Pots and Trays – Most people have a bad habit of throwing away things that can be used again, and that includes the seed starter pots and trays you purchase at the garden center, nursery or local grower’s market. There’s no reason you can’t use these several times. 19. Paper Pulp Cups – Here’s how to make seed starters with a make-your-own pulp. 20. Ramen Soup Containers – Start saving these containers as repurposed pots. 21. Salad Containers – Do you sometimes get take-out salads or sandwiches in plastic trays with attached lids? They make great mini-greenhouses! 22. Soda Cans – If you drink soda, stop throwing the cans away and turn them into seedling containers. 23. Sour Cream / Cottage Cheese / Cream Cheese Containers – These containers come in several handy sizes and most have sturdy lids. 24. Toilet Paper / Paper Towel Rolls – Make your own seed starting pots with these repurposed paper tubes. Simply cut them to the size you need and set them upright on a tray before filling them with soil. 25. Yogurt or Pudding Cups – Wash out these ubiquitous containers and put them to good use. Repurposing household items as seed starters rather than buying them saves you money and also saves the environment. Take a look around your home for other ideas for recycled containers.